In February the project partners – Institute of the Republic of Slovenia for Nature Conservation, Ljubljana Marshes Nature Park, Chamber of Agriculture and Forestry of Slovenia – Institute of Ljubljana, Agricultural Advisory Service and the Research Centre of the Slovenian Academy of Sciences and Art – began with the implementation of the project “LJUBA, people for the moors – preservation of biodiversity of the Ljubljana Marshes”. The project is co-financed under the EEA Financial Mechanism Programme and will contribute to stopping the trend of biodiversity loss, to improving the compliance with environmental legislation and to preserving cultural and natural heritage for future generations. The project LJUBA will close at the end of April 2016. 94.9% of the total project value of EUR 554,274.20 will be co-financed under the EEA Financial Mechanism. The Ljubljana Marshes is one of the most bio-diverse and most significant areas in Slovenia. Throughout centuries the presence of man formed the landscape and established conditions for life for numerous rare, endangered and protected species of flora and fauna. However over the past few years the situation has drastically exacerbated, in particular due to the changes pertaining to agricultural use. Today the state of numerous species and their habitat types, located within the Ljubljana Marshes, is poor or even critical. The aim of the project LJUBA is to contribute to improving the state of three qualifying habitat types (wet meadows with Molinia Caerrulea, mesotrophic wet meadows with foxtail and the healing Sanguisorba officinalis, fens) and four qualifying species (Fen orchid, False Ringlet, Scarce Large Blue, Fritillary) in area of the Ljubljana Marshes. 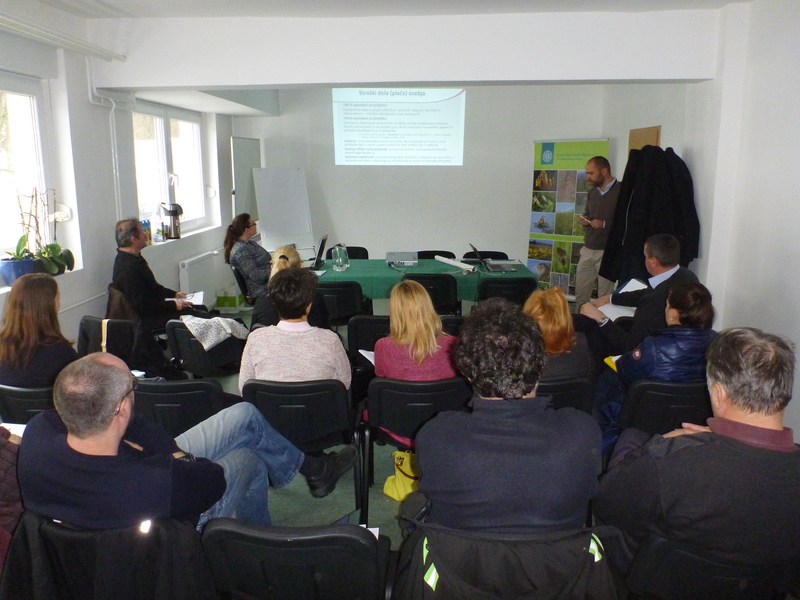 The public will be acquainted with the responsibility and relevance of agriculture in biodiversity preservation within the Ljubljana Marshes. The project aims to encourage a large number of the heads of agricultural holdings to apply nature-friendly agricultural practices also by improving cooperation between the experts in the field of agriculture and nature protection. Various methods of removing invasive non-native species Solidago will be tested on selected sites, and together with volunteers the wood overgrowth in the valley Strajanov breg, which is the last remnants of fens in the Ljubljana Marshes, will be removed. In February and March several training courses have already been organized, namely for managers of agricultural lands. Meetings and individual discussion panels are also planned to take place in the coming months. All owners and lessees of agricultural land in the Ljubljana Marshes, who wish to participate in the project or learn more about environmentally friendly agricultural practices, can visit the Landscape Park or the Agricultural Advisory Services, covering the area of the Ljubljana Marshes.